The determination of when our ancestors first became habitual bipeds necessarily depends on the recovery of relevant fossils, but understanding how this transition came about has traditionally relied on comparative anatomical and functional analyses of those fossils. 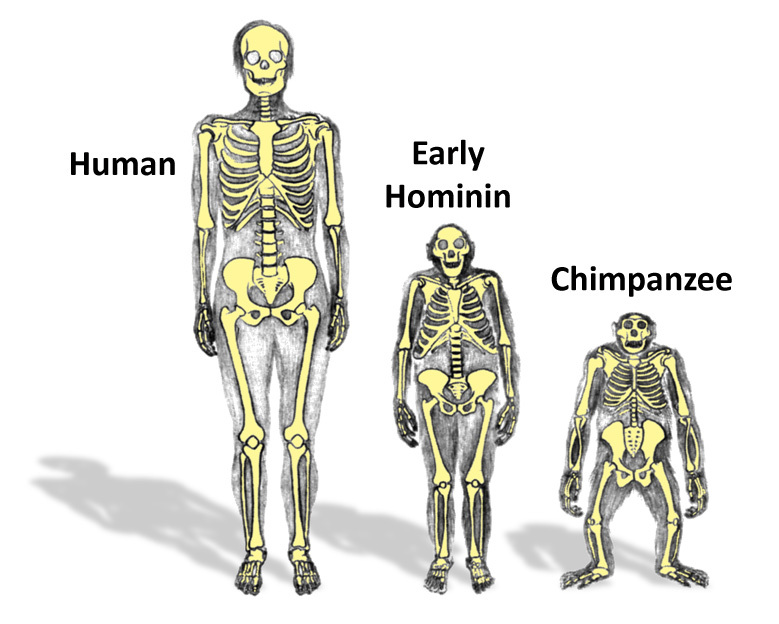 Each time a new fossil is found, its morphology is typically compared and contrasted to that of modern humans, other fossil hominins and our closest living relatives, the extant apes. These analyses often reveal a unique mosaic of features not quite like any living form, making the functional interpretation of this morphology difficult and often controversial. While few would argue against the importance of considering the “total morphological pattern” when attempting to reconstruct the locomotor behavior of any extinct species, it is less clear exactly how this should be done. The development of computational biomechanics with the ability to consider a variety of parameters and conditions, offers a means for gaining the needed integrated view to reconstruct the locomotor behavior of extinct species. Given that computer modeling is attempting to simulate an extremely complex, multifaceted system, it is an intricate procedure, dependent on a great many factors, and the underlying assumptions and parameters used to develop a computer model will have a great influence on the results of the analysis. Depending on the question being addressed, the modeler must make a variety of decisions regarding not only how to construct the model, but what the model should attempt to optimize or emulate. In addition, there are different modeling techniques, and which is appropriate varies with the types of questions being asked and the availability of requisite empirical data. Some past modeling studies that were focused on reconstructing the locomotion in extinct fossil hominins have relied exclusively on human locomotor data as inputs, likely biasing the results. Other studies that have generated locomotion de novo using models of fossil hominins provided no means for validation of the results. A potential solution to these problems would be to perform the same model-based locomotion simulations for two extant species that are both closely related to our extinct human ancestors, coupled with comparable detailed sets of empirically based locomotor data obtained from both extant species to be used for model inputs and validation. The obvious choice to pair with simulations of modern human locomotion is simulation of bipedal walking in chimpanzees. Team members Brian Umberger and Leng-Feng Lee of UMass, and Matthew O’Neill of University of Arizona spear-headed the development of a computational model of the chimpanzee pelvis and hind limb musculoskeletal system that is being used to evaluate the biomechanics of the form of facultative bipedalism that chimpanzees exhibit (O’Neill et al., 2013, 2015). The computer model is complemented by a detailed set of empirically derived locomotor data collected on three chimpanzee research subjects that were loaned to the Stony Brook Primate Locomotion Laboratory from the New Iberia Research Center (NIRC) in Louisiana. Together, these modeling and experimental investigations are being used to reconstruct the most likely manner in which our earliest human ancestors walked on two legs.